It was a few days before Easter — shortly after the memorial service, so my grief was still fresh and raw. "Let me focus on the task at hand," I thought, feeling another wave of sadness coming on. I was on a mission to find an Easter Bunny to donate to a local children's toy drive. 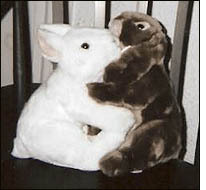 I already had a white bunny at home, Doug's Easter present from a friend, from the year before. It had been waiting to be unwrapped as soon as he got well enough to receive it. Of course that time never came, and now the brand new plush toy still in the box was too painful for me to look at, let alone give away yet. I tried to let it go, taking the box down from the shelf a few times, looking at the white fuzzy critter with big brown glass eyes inside, but each time I'd change my mind and put it back. It wasn't mine to give away, I thought irrationally. It was Doug's bunny. "Honey, where are you?" I wanted him to answer, feeling the rage of loss all over again. I wanted a sign, just one more word, a message that the love was still there. I prayed for something, anything to lift my spirits before I sank too low again. Fighting the crowds on Time Square I walked into Toys 'R Us and asked a sales person where I could find a white plush rabbit suitable for a small child. "Oh, they're all sold out by now, I'm sorry," said the sales lady. "A lamb, or a chick, might be a good seasonal gift choice. We have those," she suggested. Just as she said that, a couple walked by me holding the hands of a little boy, about 4 years old. "I want a bunny!" he screamed. "You heard the lady, sweetie, there are no more bunnies for Easter." His mom tried to reason with him in what sounded like an Aussie accent. They looked like tourists from Down Under. "Oh yes, there are!" he yelled back as he broke loose and darted off to a corner of the store. His alarmed parents ran after him as he shouted back "He is showing me where the bunnies are!" "Who, Timothy?" his startled father wanted to know. "I don't see anyone." His wife hushed him saying, "It could be an invisible friend," at which they both smiled. Timothy reached into a row of plush animals and "There!" he shouted, pulling out a realistic looking stuffed brown meadow rabbit. "I want him! This is my Dougie Bunny!" Both his parents and I stared at him incredulously from down the aisle. "What did you call him? How do you know his name?" his mom asked. I was sure I had misheard. "I know because he," — said the boy pointing into thin air — "Douglas, told me when he showed me where to find a real bunny. "Yup... it's a Dougie Bunny and I want him for Easter!" His parents just looked at each other; finally his dad said, "I see. It's a man's bunny, honey, 'ey?" He winked at his wife. "None of that white, fluffy, girly stuff for our Timothy, this Easter, right?" And they merrily marched off toward the cash register. Gratefully astonished I retraced the child's steps and found another rabbit just like his. Another surprise was still yet to come, after I returned home with the newly purchased gift. I didn't have a box to put it in, so once again I reached for the one on the shelf with last year's present still intact. Opening the cardboard top, fresh tears welled up in my eyes. The white bunny inside was the exact duplicate of the one I had just bought; only the colors were different. They were twins, one white and one brown. I gave thanks for answered prayer and the children's toy drive received both bunnies from Doug that Easter.